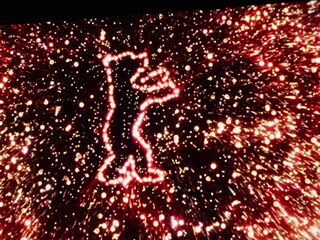 It is the end of February and the managers of the 68th film festival in Berlin, known as the ‘Berlinale‘, rolled out the red carpet where the stars and filmmakers walked along during the last 10 days. Every year I cannot wait until my Berlinale job gets started and I receive the badge which gives me access to all films and world premieres. During the festival there is a special atmosphere in Berlin. A variety of movies can be seen all day long and very exclusive parties are taking place. You can meet intersting people and one or another movie star can be admired on the red carpet. Last year, I submitted a short movie produced by myself and made it out on the big screen for a moment. In my youth I dreamed about becoming an actress, because I thought playing all different kinds of imaginable characters would give me access to all perspectives of life. So from time to time i like to slip into a little role and take take part in small film projects. So, how did the Berlinale originate? Berlin became a film city in 1895, when the Skladernowksy brothers premiered nine short films in famous Wintergarten Varieté theatre to an excited audience. The Skladernowsky brothers were very poor, and they quickly got kicked out by the wealthy Lumière brothers, who won the harvesting laurels as first filmmakers in the world. The Skladernowsky brothers lived in Berlin Prenzlauer Berg just in front of the legendary curry sausage station,“Konopke“. At the bottom of the house where they lived, and from where they have shot street scenes from their flat on the top story, you find a metal plaque in the ground which reminds us of their glory days. Lots of great movies were produced since then in Berlin. Along with awesome directors like Fritz Lang, Ernst Lubitsch, Emil Jannings and stars like Marlene Dietrich. Films like, Metropolis, The Cabinet of Dr. Caligari, Dr Mabuse, and many others, wrote contemporary history. A real film industry grew around Berlin in Babelsberg film park with the famous Ufa studios, which has been open since 1917. But the curtain fell when the Nazis came to power in 1933. Many brilliant, and often jewish filmmakers, were persecuted and killed during the horrible dark years of Nazi Germany and WWII. But the longing for beauty, illusions, dreams, and a new life after these dark years didn‘t let the Berliners and their Allies remain in agony. In October 1950, a committee founded,”Internationalen Filmfestspiele Berlin“ or the short version, ”Berlinale“ under the leadership of the US film officer Oscar Martay. On the 6th of June, 1951 the first “Berlinale“ started with Alfred Hitchcocks film ”Rebecca“ at Titania palace, featuring the stunning US/UK actress Joan Fontaine. It was the Cold War period and no communist countries were allowed to take part at the festival, which was located on the West-Berlin side. Wonderful films were produced and presented in Berlin since then. With fantastic film legends like Romy Schneider, who is remembered in one of the competing films. But what about the other films at Berlinale? The festival themes center around that our world is in danger. Pollution, terror, and hunger are demanding countless victims. The glance goes into the details, naked reality needs to be investigated with a scalpel. Critics interpret the Berlinale as an art festival compared to Cannes and Venice. We have a huge section with documentaries and a section generation films. Since the year 2000 and on – the Berlinale Palace is at Potsdamer Platz the old city center of Berlin. Come and enjoy a tour with me.